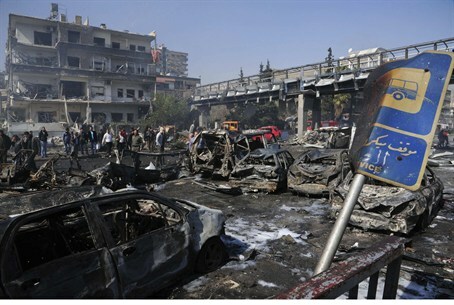 At least 31 people are reported dead and dozens more are injured following a car bombing in central Damascus. At least 31 people are reported dead and dozens more are injured with the death toll expected to rise in the wake of a car bombing near the central Damascus headquarters of Syria’s ruling Ba’ath party. Opposition activists told reporters a car bomb struck a security checkpoint between the Damascus-based Ba’ath party central headquarters compound and the nearby Russian Embassy. The official SANA news agency also reported the blast but did not say what caused the explosions. A report broadcast on the pro-regime Al-Ikhbariya television station showed images of dead bodies on the ground, and a number of cars on fire. Dead bodies went flying through the air due to the force of the blast, eyewitnesses said, landing in a nearby park. The blast occurred in the central Mazra’a neighborhood, and was referred to on Syrian state television as a “terrorist attack” by a suicide bomber. The area in which the explosions occurred is heavily populated and heavily fortified due to its ties with President Bashar al-Assad, containing a hospital, a mosque, a bus station and a school. Despite the numerous checkpoints and security restrictions within the capital, the attackers nevertheless managed to reach the heart of Assad’s empire, an Al Jazeera reporter pointed out from Beirut. “It seems that whoever was behind the attack had managed to go through many checkpoints until they got to the point where they can explode the car,” wrote journalist Rula Amin. The attacks followed two mortar attacks in as many days on the city. The first killed a soccer player when two mortar shells exploded near a soccer stadium in Damascus. In the second attack, two mortar shells exploded close to one of Assad’s three palaces in the capital. No one was injured or killed, but the building was damaged.